Even to a country long numbed by the excesses of a pompous bunch of mostly dullards who pass themselves off as ‘honorable’ legislators, the most recent revelations on how some of them surreptitiously skinned the motherland to the tune of P10 billion takes the cake. Imagine a nation with a big majority of its people barely able to sustain themselves and their families with daily essentials — many homeless or living in hovels under perilous circumstances, eking bare existence or even begging to be able to make it to another day — while some of these so-called leaders enjoying the best that a government can offer, isolated from the rest of the world in their luxurious offices, expensive chauffeured cars and already enjoying millions of fees and top-of-the-heap perks for occasional official functions still had the nerve to steal so much from the suffering people they are supposed to serve. Sen. Miriam Defensor-Santiago stated in a news report that Senate President Juan Ponce Enrile received P118 million in the Senate for 2011 in addition to having control of 52.51 percent of the entire Senate budget (the total amount for 2013 is P1.7 billion). Enrile has the discretion on how this money will be spent without the need of providing receipts and other documents. Senate Protempore Jinggoy Estrada received P62 million income, Majority leader Vicente Sotto III received P56 million, and Minority leader Alan Peter Cayetano received P55 million, Santiago said. Each senator receives P43 million a year as income but as we know it, these people don’t thrive on regular salaries only. allowances for personal services and MOOE (Maintenance and Other Operating Expenses), membership in permanent committees and Senate Electoral Tribunal. Then there’s the Priority Development Assistance Fund (PDAF), or pork barrel. Each senator is allocated an annual PDAF budget of P200 million while a congressman, P70 million. He may have been referring to allegations by six whistleblowers that their boss, Janet Lim Napoles, is the brains behind a P 10 billion racket that creates ghost projects involving the PDAFs of five senators and 23 congressmen and state agencies using 20 dummy NGOs. Also tapped by the Napoles syndicate were the Malampaya oil fund and allocations by the Department of Budget and Management for the Technology Resource Corp. (formerly the Technology and Livelihood Resource Corp.), National Livelihood Development Corp. and National Agri-Business Corp., Department of Agriculture and Department of Agrarian Reform. require mere preponderance of evidence. everything and that includes the SALNs of politicians. PHOTO CAPTION. Illustration is shared from the QUI TAM LAWS VS. 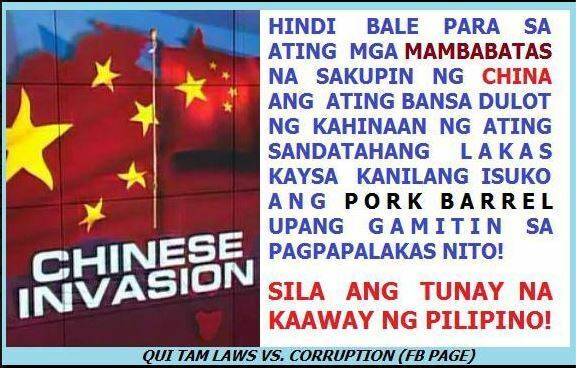 CORRUPTION (Facebook Page) through the Filipino Overseas for Better Philippines (FB Page). It conveys the people’s disgust over Philippine legislators’ preoccupation with pork barrel funds while on the other hand neglecting their sworn duties including that of the country’s defense requirements.